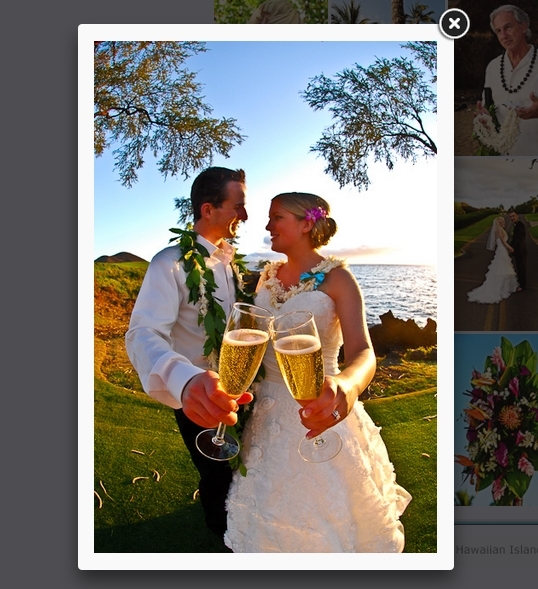 We have just launched our new Photo Gallery page on the Hawaiian Island Weddings site at http://www.hawaiianislandweddings.com/couples.html It's about time,...I don't want to say that the photos were old, but they were scans taken from 4x6 prints back when we shot film at weddings! We have retired the cameras and thrown away that scanner years ago! We have now put all new photos on the Photo Gallery page, all photos were taken in 2012 and were chosen from over 10,000 photos taken this year. Many of these photos were submitted to the Maui Wedding Association's Maui Wedding Planner magazine, slated to come out early next year. So we will probably see some of these later in print. We are so excited with how it turned out, that we can't wait to implement the slideshow in other parts of our website. Next to see the change will be our Bridal Bouquets page and then our Locations page. It's an exciting time!